City tax is included in the price (nothing to pay extra on arrival). , 2 air conditioned, independent heat, 2 televisions(LCD) 40-inch, SAT-TV, DVD,phone line ,internet access,Wi-Fi, and a security box, hair dryer, iron and ironing board, + a baby cot(upon request) and Airport transport upon demand. Walking through the alleys of Trastevere, one is struck by the magic that runs through the streets and fully understand the meaning of 'Eternal City'. Rome grows, expands, but continues to maintain a heart and pride inherited from 'ancient Rome. The position is strategic to reach any attraction in a very small time and very well connected by public transport.., Completely renovated and' decorated to offer the best hospitality in an elegant and eye for detail. Its strategic location makes it ideal for a comfortable and enjoyable holidays. The neighborhood is vibrant and packed with cafes, restaurants, gelaterias, and local shops. At 200 meters there is the famous market of Porta Portese, open only on Sundays, attracts tourists for its many antique stalls. .... At 200 meters from the station of Trastevere and you can reach the airport of Fiumicino in just 20 minutes by city train(FR1) . Hi, My name is Gianmarco. I am the owner of some apartments in Rome and I work to accommodate travelers who need quality accommodation for a short time . I love this job because give me the chance to meet many people from all parts of the world and sometimes I can make real friendships. The Trastevere area resembles a traditional Southern-Italian village with narrow and winding cobblestone streets. Many visitors like to stay in a Rome apartment in the Trastevere area because of its dining, entertainment and cultural opportunities. It is a great place to spend all day walking and soaking up Italian living. Many tourists feel that this is the closest you can get to real Rome. coffe, tea, suga,oil, vinegar, milk, salt,bread butter, jam, rusks.. The perfect spot and the perfect host. Gianmarco was the best host. He communicated with us several times before our arrival, answering our questions and providing all the information we required. He was patient the day of our arrival and quite flexible when we were delayed at the airport. He met us outside the train station and walked us to the apartment. The apartment was just as pictured. It was clean and neat and had everything we needed for our stay. He provided breakfast foods, coffee, and water. He also provided a map and instructions for the mass transit system. We couldn’t be more pleased. Highly recommend. We had a wonderful time in Italy it was our first trip. The apratment was just as it pictured and Gianmarco was so helpful and responded immediately. Great location for transportation to everything. Gianmarco was grasious enough to let us check out a little later due to our fight. He also provided great recommendations and map for our sightseeing. Thank you for your hospitality. 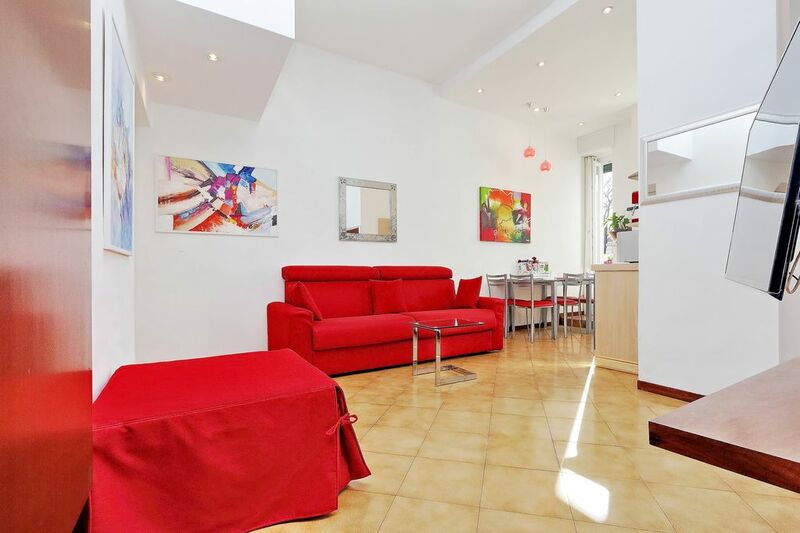 This condo is very convenient to trams and trains (tram #8 takes you to Piazza Venizia in about 20 minutes). The bed was very comfy and the tiny kitchen provides a sink, 2 burners, 2 types of coffee makers, a small fridge and a small microwave/convection oven. Plates, some cooking utensils, cleaning supplies and paper towels awaited us. This kitchen was great for breakfasts- but didn't think it would be easy for making dinners. There are plenty of restaurants, coffee/ bakery shops and food markets nearby. There fold out king size hide-a-bed was very comfy. The A.C. worked well. The washer dryer combo was nice until it needed a repair. Gianmarco (owner)was very responsive to this and any questions or concerns. It is up 1 flight of stairs (called the first floor) without an elevator- so is not handicap accessible. The door into the building is off an alley- so I would not have felt that safe at night entering if I had been alone. It was pretty quiet and the owner kindly provided a basket of snack food and some bottled water and soda in the fridge. The shower (off the bedroom) has no soap dish or place to put shampoo bottles- which was akward. We bought a suction-on soap dish which was not very good. There are lots of folders with helpful info about Rome with maps and tour books as well as regular books. There was a TV with cable in the bedroom and living room ( had International BBC and CNBC). All in all it was a comfortable place to stay (stayed 2 weeks) and Gianmarco was wonderful to deal with. This apartment is budget friendly and close to attractions of you are ok taking the transit system. If you are expecting to walk out your door to have many options to eat and explore I recommend you stay closer to the core. We had an elderly with us so had to take a taxi to anything of interest. The apartment was clean and owners accommodating but I had wished we stayed walking distance to the best areas. There is a great cafe on the corner open late night and early morning. Staying the last two weeks of August most shops in the area were closed. This is more of a local neighborhood. 3 of us stayed here comfortably and felt safe. This apartment has everything you will ever need. Even free coffee and a little something for breakfast. Perfect for 2 couples. Very clean and close to everywhere we needed to go. There’s a restaurant called Maximum nearby that’s soooo delicious! and a donut shop downstairs. Overall, the place is very convenient. I highly recommend it. We rented Gianmarco's place in Rome for a girls trip. We had lots of fun and were very satisfied in this apartment. It was very close to public transportation, markets and we even found a great restaurant a couple blocks away. If you are staying here the only thing I advise is to clarify the exact address before your trip so you are prepared. There was some confusion on this, and after a long day of travel you want to have all your ducks in a row. A favorite place among many is Big Mama, where you can enjoy concerts playing jazz, rock and blues. Big Mama is a place where aspiring young singers hit the stage in the hopes of becoming famous. This is also a great area to go out for dinner. Not only are there plenty of authentic Italian restaurants with high-quality pizza and pasta dishes, but many of the restaurants open earlier than in other parts of Rome to cater to tourists. In other parts of Rome, it is rare to find Romans who eat before 8 p.m. The Trastevere is known for delicious food and some of the best restaurants in Rome. The La Fraschetta is considered to have the best gnocchi in town and offers customers four different sauces to go with the gnocchi. Another restaurant, Ristorante Asinocotto, has dishes made with fresh produce, sourced at the owner's own farm.